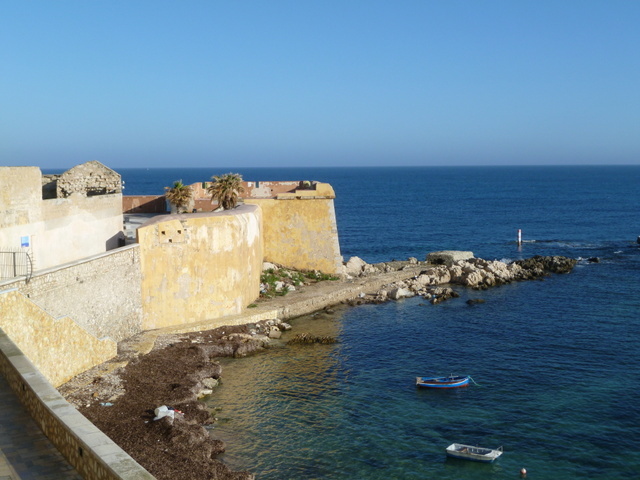 City wall of Trapani, as viewed from the terrace of our apartment. When I said we were going to Sicilia, Italian friends sighed, American colleagues raved, and my dear friend Nicholas whined that he could not be there too. Thanks to all, I received some great advice on things to do and places to see. 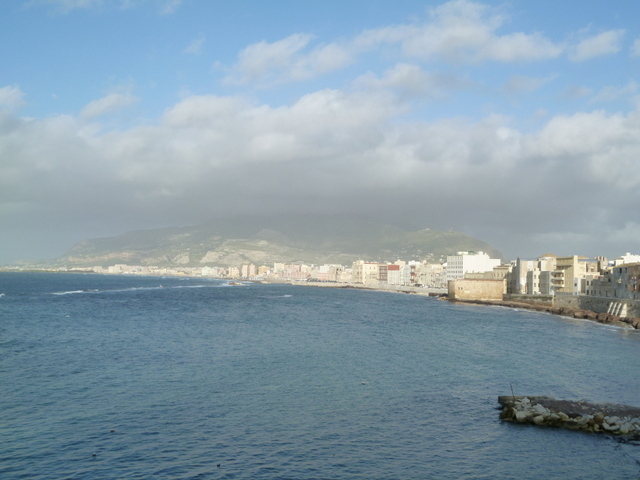 Sicilia is beautiful, to say the least, the people are friendly to a fault, and the food is divine. We took our first flight since arriving in Italy last May. It seemed strange to fly out of Rome instead of taking a train and we were pleased to discover we had not forgotten how to drive, as neither of us had done so for 10 months. Stopping by the grotto in Lo ZIngaro. People lived here as long as 10,000 yeasr ago. I wanted to stay in Erice, a medieval town about 2400 feet abve Trapani, but Francesco, Rick and Jane were right to advise against it as a base. It has been encased in clouds for 3 days now. It’s much better here at sea level. Erice is atop the hill hidden in a mass of clouds. Our arrival day devolved into a miserable rain and chill, warded off by an amazing dinner involving the best caponata we’d ever eaten, fresh fish, and a couscous preparation like none I’ve ever had, served with a whole roasted fish and a tureen of fish broth. With a crisp local white wine, we were satiated and slept a full 8 hours for a change! 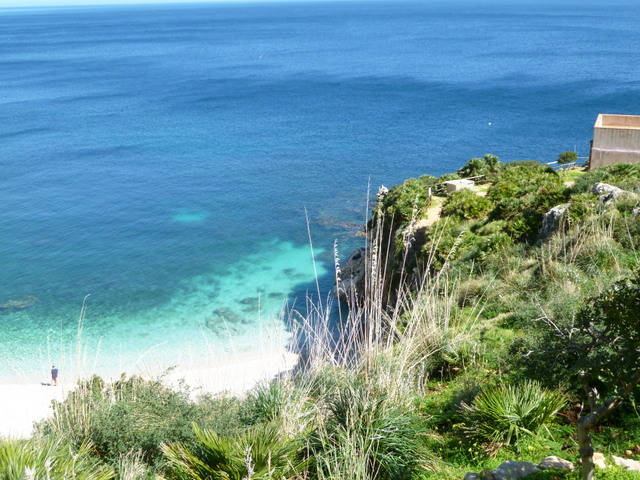 Crystal clear waters far below the trail in Lo Zingaro. 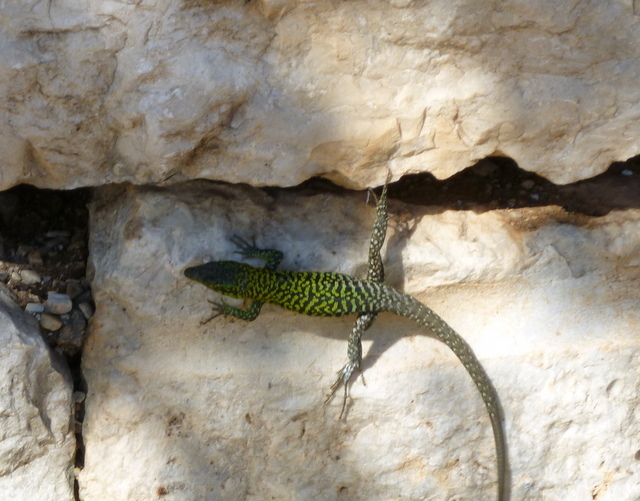 Little lizards dart along the trail enjoying the sun. So did we. as the sun warmed the day. A half-hour or so into the hike, we encountered a small museum dedicated to the contadini (farmers) where an amicable man told us about the activities and dwellings of a typical farm family. We were his first visitors this day so he was ready to chat. My Italian understanding is really coming along, thank God, and we had a decent conversation. There is a grotto along the trail where they have determined people have lived for some 10,000 years. Amazing to consider how ancient this land is. Also, I got some sun as ordered by my doctor who thinks I need more vitamin D.
The hike was a good workout so we indulged in a fine Sunday lunch of fresh fish, fresh pasta, and an arugula salad, enjoying the antics of little children dining with Nonna e Nonno at an adjacent table. 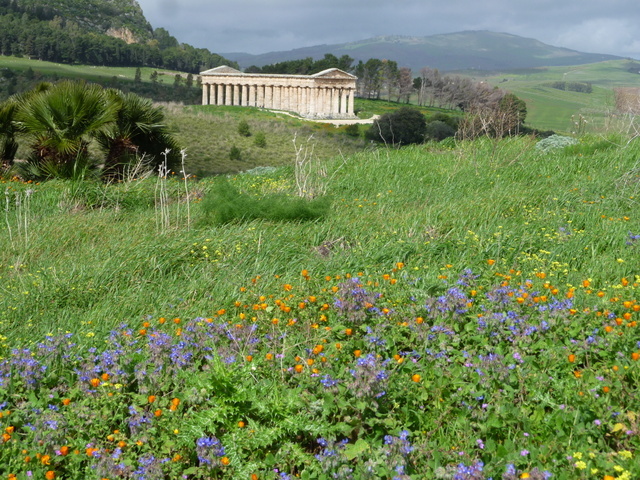 Greek temple at Segesta, viewed from afar. Clouds come and go, with passing showers. 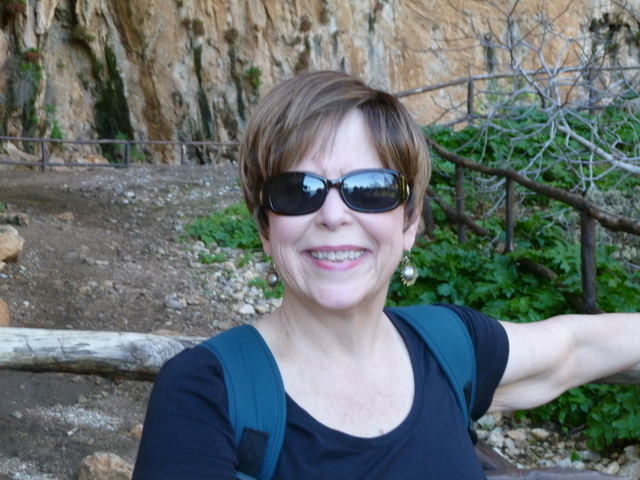 The temperature is not warm enough for beach time, but excellent for exploring, so Monday we headed to Segesta, where we saw our first-ever Greek ruins. This is a marvelous time of year to visit without crowds or the dizzying heat of summer. We found ourselves alone beside the magnificent temple, in the ancient arena, and along quiet paths. The temple is huge and well-preserved. One can walk completely around it for an excellent perspective on the architecture. Built in the 5th century, B.C., it has survived at least three earthquakes, and has withstood the ravages of man for so many centuries, but the courthouse in Salem, OR, barely lasted a decade due to poor construction. After an up-close encounter with the temple, we ascended the hill opposite (305 meters above sea level) where the city used to be, to the location of an ancient arena. There we found gorgeous views back to the temple across fields of wild-flowers in bloom. My favorite travel companion in the ancient arena at Segesta. a freshly made pastry even at an archeological site. Try that at Silver Creek Falls or the Mount St. Helens.Stay-tuned. More to come…. 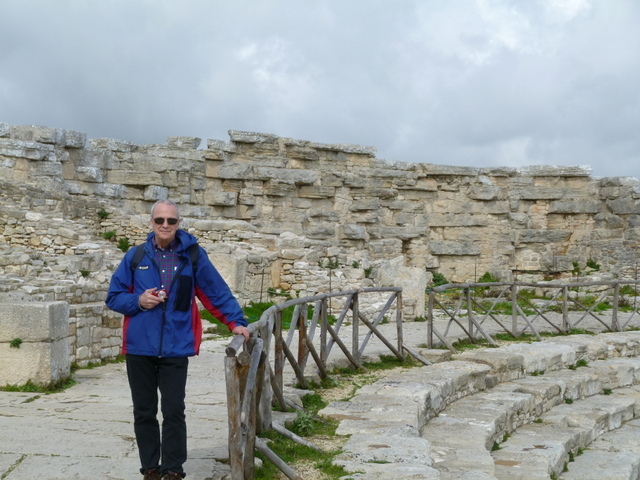 M – Segesta and Erice are quite different experiences. They are also close together, so easy to visit both even in one day. I am not familiar with Scopello as the road was impassable when we were there. Happy travels! YOU LOOK AMAZING! I would not recognize you if we passed on the street! Italy certainly agrees with you, Bella! Thank you for continuing to share your adventures. I get so excited when I see a new post in my e-mail. Brava! Grazie, Terah! I’d hate to have you not recognize me but I’ll take that as a positive. I think I need to have my passport photo retaken as I have changed a bit with the weight loss, working out, and new ‘do. Love your writing! Thank you for sharing your adventures! Ciao, Carla! Thank you or reading and for the compliment. I do like to write when I have time…. I am so happy you are loving the land of my origins!! Trapani is a lovely little city on the coast and Segesta rivals anything I have seen in Greece! Buon viaggio mia cara amica e tanti auguri!! Ciao Bello!!!! Grazie! Saluta anche Wally per noi. What a wonderful life you two lead. Sicily is beautiful! Laurel, I LOVE your new hairdo! Looking forward to reading Part II. Thanks Geeg! We ARE enjoying our life here…. Punctuated with work of course, but I do like my job too. You can’t take a vacation unless you have a job, I always say! You and Dave should come over and see us sometime. That would be awesome! We might just take you up on that sometime! Stop sending all those gorgeous photos and blog posts that make me wish we were in Italy NOW! We will be there as soon as we can, but summer 2014 seems SO far away! Seriously, what a fun adventure in Sicily. Wow. I know we will not have as much time in Italy as I would like to spend, so thanks for letting me live vicariously through you for a little bit. Give our best to Ric. Beautiful! Looking forward to your visit to say the least! In the meantime, I will continue the torture. Love you, too! I love traveling with you. I’ve been thinking of you as the Pope has stepped down. What an interesting time to be in Rome. Can’t wait to hear your thoughts on what is happening around Rome when you have time to blog it. Thanks as always, Diana, for your comments. I am not a very political person. Being neither Italian nor Catholic, I don’t feel particularly qualified to weigh in on the elections of either government nor Pope. We watch with interest, however! Beautiful photos and sounds wonderful! Want me to bring a bottle of Vit B pills for you? Oh, I’m so glad you are taking a break in Sicilian!! We almost did a trip there with a friend whose ancestors were from there. And, how is Rome doing without the Pope? Thanks for the blogs! No Pope and a government in transition: interesting times in Italy! You both look great. Life in Italy suits you. Grazie Julie! E vero! We are very much enjoying our life here. Hope all is well in Forest Heights! I want to thank you for letting me feel like I’m a part of your adventure and I have to say this was the best blog ever. I could almost taste that expresso. Thank you Joyce. Nice to know you are out there following along. Hope retirement is treating you kindly!